Nutmeg is a threat; cinnamon, not so much. 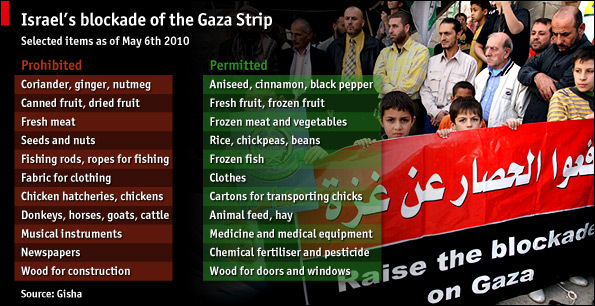 It’s not actually as arbitrary as it appears, however: If you look closely you’ll see that much of what is prohibited are items that would allow the Palestinians to support themselves (fishing rods), whereas what is permitted are items that keep them dependent on the Israeli economy (frozen fish). Still not clear on the nutmeg/cinnamon divide, though. The nutmeg/cinnamon divide is that cinnamon is more of a staple spice. Basic food staples are allowed. In choices between similar staples, those suitable for storage and those of higher quality are disfavored, the former more than the latter. Hence no canned or dried fruit, but fresh and frozen, and no fresh meat but only frozen. Nutmeg, Ginger and Corriander are also seeds. You could use them to grow more.